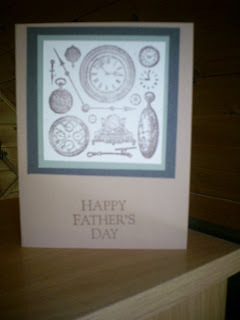 This past week I made a Father's day card for my father-in-law. I think I may reproduce it and make masculine birthday cards. The cardstock is from "Stampin'Up!". The colors are tan, brown, and mellow moss. I can't remember the actual name for the colors, just that they are SU. I had tried to start another towel using my own pattern. Not such a good idea! lol ;o) I'm going to unravel it....again....and start again using the pattern I used for the other one. Be sure to stop by Shereen's blog and see what crafty things other bloggers are working on. Oh! And be sure to add your crafty project to Mr. Linky. Posted by Lisa at 8:20 a.m.
That is a really cute card!! I love to make homemade cards! I rememeber spending SO much money on birthday, anniversary, etc. cards but homemade ones are SO much cooler and more creative! June 22, 2007 at 1:29 p.m. Your dad-in-law must have loved getting that card. You did a lovely job on it! June 22, 2007 at 2:16 p.m.
What a crafty person you are! I haven't a crafty bone in my body. June 23, 2007 at 1:33 p.m. Thanks for visiting my blog and the nice comment on my skirt! June 24, 2007 at 9:11 a.m.